Today is the 32nd birthday of Kirsten Dunst, who ranks as one of my favourite actresses. Emerging as a precocious child star, she has successfully made the transition to adult stardom because of her versatility, emotional range and depth which she imbues in her roles. This post is a tribute to the remarkable talents of this woman. As Claudia, a former plague victim turned into a the vampire who is forever stuck in the body of a doll-like little girl, a young Dunst made a huge impact in Interview With the Vampire. As Amy March, the playful youngest of four sisters growing up during the Civil War in Little Women. As the sexually precocious but increasingly isolated Lux Lisbon in The Virgin Suicides. Sassy and competitive as a cheerleader in the comedy Bring it On. As Mary Jane, the object of the main hero’s affections in Spiderman. Bitchy yet vulnerable as a college girl brought up to be the ideal housewife in Mona Lisa Smile. Luminously portraying the eponymous and infamous monarch in Marie Antoinette. Emotionally raw and strikingly powerful as a bride swamped by depression as a planet is heading towards the Earth in Melancholia. Many more roles could be listed, but I would need a lot more pages. So thanks for reading this birthday tribute to Kirsten Dunst and please leave comments. What is your favourite performance by Dunst? Why do you like her as an actress? Whatever your opinion, please give it. Accorded a mixed reception upon its release, Interview with the Vampire is a mature, Gothic and well-mounted tale soaked in both sadness and blood from director Neil Jordan and scripted by Anne Rice, from her own novel. I personally have never really had a problem with the film and have felt it has been underrated over the years since its release. Anyway, back to my review of it. Interview with the Vampire begins in modern-day San Francisco. Daniel Molloy is an eager reporter who documents people’s lives. His client this time is Louis de Pointe du Lac, yet Louis is no ordinary client. He is a 200-year-old vampire. Louis wants to tell Daniel the story of his life after he was “born into darkness”, fascinated Daniel begins to listen. The film flashes back to Louis’ life just before he was transformed into a creature of the night. He was an owner of a plantation just south of New Orleans in 1791, who fell into deep depression after his wife died in childbirth. Wanting to be freed from the pain and suffering, Louis was turned into a vampire by the cunning Lestat. 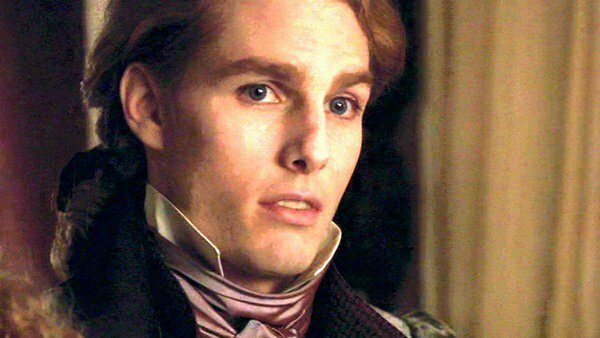 Louis later comes to regret wanting death as Lestat has now condemned him to immortality. He finds it hard to live as a vampire because of his good nature and this impacts on the fact that he can’t bring himself to kill humans in order to survive. Lestat on the other hand shows no mercy and enjoys draining the life away from humans. Although commonly at each others throats, the two are bound because of their vampirism. One night the hunger inside Louis causes him to bite the neck of Claudia, a young plague victim. Lestat sees the little girl as an opportunity for company and something to make Louis stay as he knows the guilt Louis suffers from. He transforms Claudia into a vampire and they form a somewhat macabre ‘family’. As the years pass and the family move from place to place, Claudia forms a bond with both Louis and Lestat. Lestat teaches her to be a killer of which Claudia has no problem as she has a thirst for blood that challenges even the brutal Lestat’s, whereas Louis becomes almost a surrogate father to the child he never had. Claudia eventually becomes resentful of Lestat for turning her into a vampire, as she still retains the doll-like appearance of a young girl but has mentally grown up into a woman. Events soon come to a head between the three as power shifts between them and Louis attempts to search for answers regarding vampires. Stunning visuals, gorgeous set decoration and all round great performances populate this melancholy tale of the loneliness of being a vampire and the Gothic horror surrounding it . The first thing to praise in Interview with the Vampire has to be Neil Jordan’s directing. We get a vampire movie with a sombre heart that is very adult and mature in theme and does not pander to a younger audience. Anne Rice writes the screenplay from her own novel and generally succeeds in being faithful to the source material. The visual design of the film should definitely be praised for the way it captures the various time zones and countries encompassed within the narrative, from Louisiana to Paris. Set decoration is particularly stunning in the scenes of an underground group of vampires that Louis and Claudia find, the various catacombs and chasms glimmering in candlelight with a Gothic splendour. Make-up and effects are also of the highest order in bringing to life the lives of these vampires. Standout scenes include Louis watching his last sunrise before his transformation, Claudia convulsing violently during her metamorphosis as her blonde hair morphs into red curls and a gruesome scene of vampires putting on a play involving the sacrifice of an innocent victim. The score provided makes for an eerie listen that highlights the themes of darkness and sorrow; the opening sound of a single choir boy’s voice singing a lullaby is enough to send chills down the spine. The presence of Louis’ mournful narration adds a certain pathos to the story, as we listen to his experiences and how he feels that being a vampire is a curse, and not a gift. Although there was controversy surrounding the casting of Tom Cruise as the flamboyant and sadistic Lestat, Cruise handles the role in an effective enough way. It’s not one of his best performances but he still gives the role his best shot. Brad Pitt is very good as the tortured Louis, bringing sympathy to the role of a man living an endless life of regret and pain. It is Louis who forms the centre of the story as we witness his reluctance to harm in order to survive and his relationship with Claudia. 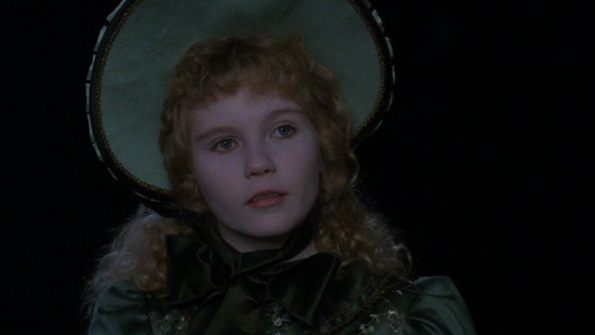 The biggest impression made on the film has to be a very young Kirsten Dunst as Claudia. She plays her role with an astonishing amount of maturity whilst also showing a devilish side to this vampire. Claudia is the most tragic of the trio of main vampires; as an audience we feel her struggle at learning that although her mind has matured, her outward appearance will always be that of a young girl. In many scenes, Kirsten Dunst steals them from her more experienced co-stars with her mix of startling complexity, expressive eyes and sense of entrapment. Fleshing out the supporting players is a seductive and dangerously charming Antonio Banderas as the head of a secret sect of vampires, Christian Slater as the man listening to Louis’ extraordinary story and a menacing Stephen Rea as the deceptive Santiago. For those who want a sumptuous, blood-soaked tale of regret, Interview with the Vampire is most certainly advised viewing. Bold, melancholy and mature, it is a vampire film that questions the effects of transformation and whether it is as great as it first appears.